I’d never even had Indian food until I was twenty years old. Chinese, that I would have quite often, in large restaurants with bronze etchings on the wall and rotating trays on tables. Pineapple chicken, fatty dumplings, deep-fried Nutella to finish. I discovered Japanese food when I was sixteen, at first sceptical, then taken aback by the soft texture of the sticky rice, finally in love via my sushi equivalent of a gateway drug, one of the most westernised sushi rolls out there – tempura maki with a hearty dose of mayo. But Indian, that was new. I was twenty years old and went to this beautiful restaurant, deep red walls, heavy curtains, folding screens shaped like the silhouette of the Taj Mahal, red table cloths. We were greeted with a few thin, crispy flatbread which I did not recognise, and three little silver bowls filled with sticky, jammy chutney and pickle. There were bowls of water with floating flowers in them. I’d never even heard the word “poppadom”, or seen any of its spellings, but I was delighted. I think I ordered tikka masala, and a dahl, all fluffy and creamy. The menu largely made little sense to me – madras and vindaloos and masalas, what was the difference? Before then, the only “curry” I’d had was my mum’s rendition made with supermarket yellow curry powder and double cream. I didn’t know what it was supposed to taste like. Of course, living in Britain, Indian food is as ubiquitous as, I don’t know, chips. I have since had a lot of North Indian, South Indian, Pakistani food. I’ve had mediocre, bland meals and fiery, delicious feasts. I’ve had it in front of the television or in a white clothed restaurant. I’ve had warming bowls of lentils and squidgy paneer in creamy spinach, tikkas and lamb ribs and dry meats, soupy and sweet lentils, chewy parathas and jewelled pilau rices. And I always crave more. 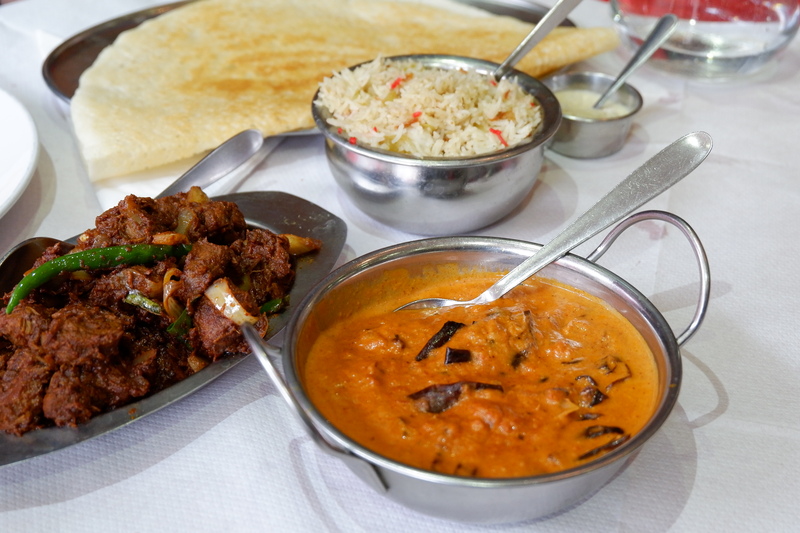 Apollo Banana Leaf is a South Indian and Sri Lankan restaurant in Tooting, an area famous for its great curries and home of some of London’s Mayor’s favourite restaurants. It’s BYO and very busy in the evenings, but much quieter around lunchtime. Service is warm, friendly, genuinely happy, in a way that I hadn’t experience in a while. The space itself is quite small, ornate with huge photographs of landscapes, deep hues of blue and green against the warm yellow walls. 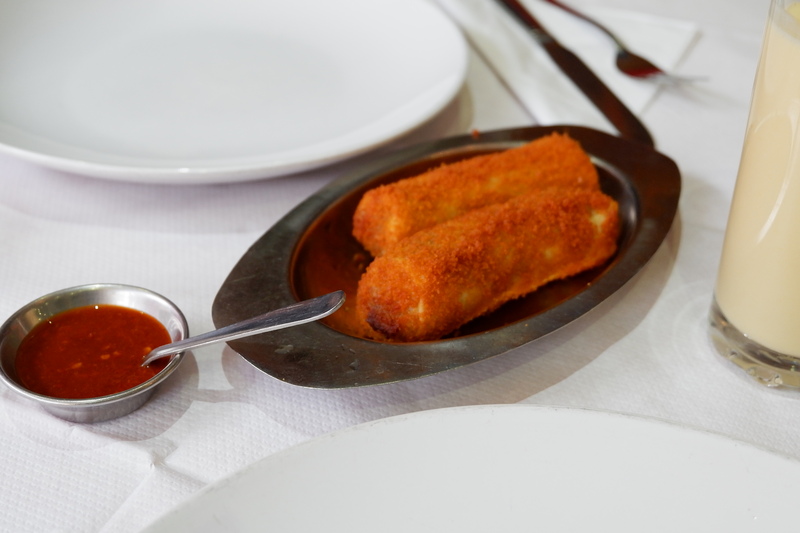 We started the meal with a mutton roll, a delicately spicy croquette filled with mutton meat, its pancake coating bright and crispy. Then an almost lacy dosa, a kaleidoscope of texture, soft and chewy and crispy, the batter a little tangy and nutty, to be dipped into sambar, a tame tomato chutney and an especially delicious coconut chutney. Then came my personal highlight, devilled mutton; a generous pile of tender but sturdy mutton chunks which was fiery and addictive. A perfect balance of heat and acid to liven up the meat. And the aubergine curry, delicate slivers of the nightshade swimming in a sweet, creamy, mild curry, to be spooned over fluffy pilau rice. As full as we could be, but planning another visit to try the seafood dishes, came the bill: at £13 each, Apollo Banana Leaf wasn’t just serving delicious food: it was almost laughably good value.